Jane offers a discount of 25% on their first / introductory lesson! 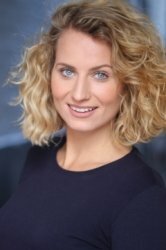 Jane studied Professional Musical Theatre full time for 4 years at Cambridge Performing Arts. Here she was trained in both contemporary and classical vocal techniques by top industry professionals. In her final year she was appointed Head Girl and graduated with a distinction. Since then, she has worked as a lead vocalist in America as well as working in theatre, radio and events in the UK. She is currently based in Greenwich. Alongside private singing tuition, Jane teaches Singing, Dance and Drama classes at a local performing arts school, with students ranging from 3 to 18 years of age. Here she has developed her teaching skills and has a good understanding of how to approach different age groups. As well as teaching harmony work in choral classes, she also tutors solo work and helps students with exam pieces, upcoming performances and entrance auditions for vocational colleges. Jane comes from a musical family and her brother is a successful singer songwriter. As his sole tutor, she has coached him for major gigs, supporting the likes of Gabrielle Aplin and Jack Savoretti as well as for headline London shows. Jane begins the lesson with a few vocal warm ups and breathing techniques. She will organise before hand which songs the student is interested in working on and will prepare the backing tracks for the lesson. Whilst working on the songs, Jane will use different vocal techniques to discover which ones you find most effective in order to achieve results quickly. She believes confidence is a key component in singing and ensures lessons are relaxed, positive and fun in order to get the best out of her students. Jane is willing to tutor for any needs, whether you need a one off lesson to help you feel more at ease before a performance or you want regular lessons to improve, do not hesitate to get in touch.